Note: This post was originally published on 10/21/13. Before everyone has a collective heart attack, let's make it very clear that we're talking about a new Aliens video game, not a movie. However, the core idea behind it is rather intriguing, which is why we're writing about it on Movies.com. The game in question is called Alien: Isolation, and Kotaku's sources say it'll actually be all about Ellen Ripley's daughter. Yes, a character we never even got to know in the movies (she's only referenced in the special edition of James Cameron's film) is getting her own movie. UPDATE 1/7/14: Watch the trailer for the game below. But before we get to this new game, it's important to acknowledge the last video game inspired by the big-screen franchise. By all accounts Aliens: Colonial Marines was a total disaster when it was released earlier this year. It was met with overwhelmingly negative reviews that picked apart its buggy gameplay, dreadful A.I. system, and a bum story that didn't come close to the standards of the big-screen franchise, despite a promise that it would be the first game ever to be considered canon within the official Alien universe. So it's understandable anyone familiar with it would be weary of any new games in that series. That's why it's important to note what brings us here today is being developed by a different company entirely and has nothing to do with the Colonial Marines. Now as for Alien: Isolation, how exactly do you make a story about Ripley's daughter getting mixed up with xenomorphs considering she died during the 57-year span between the events of Ridley Scott's Alien and James Cameron's Aliens? That's easy, actually. Just have her get involved with the Weyland-Yutani Corporation. Perhaps she followed in mommy's shoes and worked for them. Maybe she went out into space to look for her mom's escape pod. There are plenty of ways you could work her into the story and it wouldn't be a complete slap to the face of fans everywhere. It'd also retroactively make Burke, Paul Reiser's Aliens character, even more of a corporate jerk because it means he was lying to Ripley about her daughter dying of cancer. "You, as Amanda, spend most if not all of the game on a single space station, according to our source. There's only one alien for 'most' of the game, our source said; you'll mostly be shooting through 'clones and soldiers.' Vents, lockers and melee weapons are a big part of Isolation, our source said." Now as a fan of both Alien and survival horror games in general, that sounds like an intriguing prospect. If all you want to do is shoot at wave after wave of rushing xenomorphs, you can already do that. The idea of playing as Ripley (albeit Amanda, not Ellen) as she wanders around a space station, trying to survive a single alien's presence, is an exciting one. It's a way to pay tribute to Ridley Scott's film without being a full-on remake. Plus, The Last of Us reminded gamers everywhere you can create a whole lot of tension by limiting a player's resources. It'll actually be refreshing to have the option of exploring a new sector of the Alien universe without big machine guns, flame throwers and generic action crap getting in the way. As of right now Sega (which has the license for all Aliens games) isn't confirming or denying Kotaku's report, so all we know for sure is that it trademarked the name Alien: Isolation. But, we really, really hope that this type of game does come to pass. 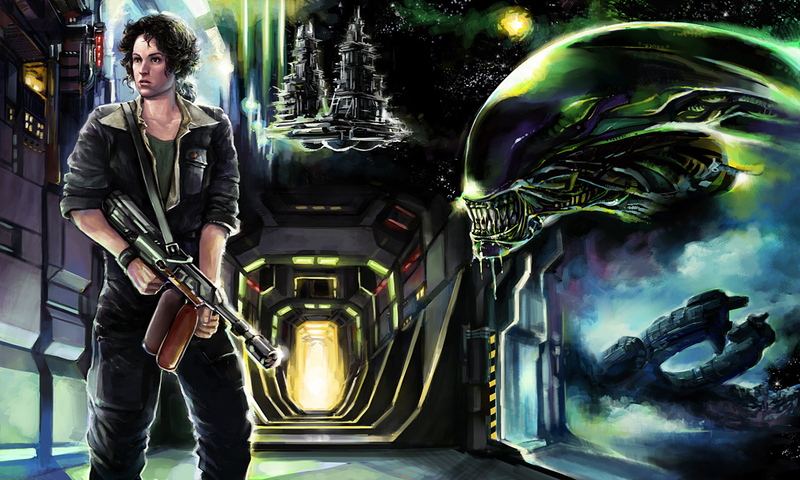 We could take or leave the whole Ripley's daughter thing, but we'd love to be able to experience a new game that's at least the spiritual child of Alien.